Pupils from Selsey Academy are inviting people to attend a community event on Saturday 28 July to raise awareness of road safety. There will be lots of activities taking place at The Selsey Centre and Manor Park from 2pm until 4pm including cycling, go-karting and dog training. 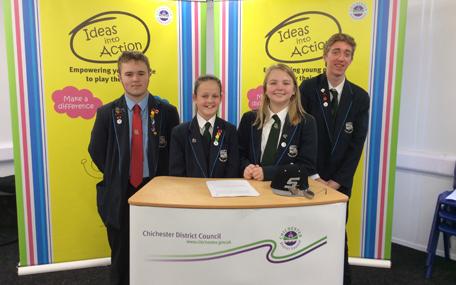 The event has been organised by the young people who took part in Selsey's first ever Youth Conference last year, as part of the Ideas into Action programme run by the youth engagement team at Chichester District Council. The pupils formed their own 'political parties' based on issues that affected them and developed their ideas with the help of a number of partners from Chichester District Council and local charities. Each group then had the chance to present their manifestos to the whole school on Vote For Me day and the rest of the school voted for their favourite party. The Road Recognition Party won the vote and the chance to bring their idea to life. The council's youth engagement team has been working with the pupils to organise a fun event for all ages to promote road safety. Cycle safety will be a key focus of the event. People can take part in a cycle challenge to see how many laps of the cycle track they can complete in 15 minutes. The challenge will be open to all ages and balance bikes will be provided to allow young children to take part. All participants will receive a medal for their efforts. A local dog trainer will be attending the event to teach dog owners how to keep their dogs safe when out walking. Dog owners can also register to take part in the dog show where rosettes and prizes will be awarded to the best-behaved dogs. There will be lots of activities around vehicle safety at the event. Children aged four to ten can have a go at driving round the go-kart track in battery powered go-karts. Young Driver will be running a competition to win a free driving experience for 5 - 17 year olds. A number of local organisations will be attending the event to promote the road safety message. West Sussex County will be giving bike maintenance advice including fixing punctures and checking brakes. The police will also be attending to promote bike security and bike marking to help prevent bikes from being stolen. There will be plenty of refreshments on offer from Thai Taste Noodles and Giuseppe's Gelato Cart. Money raised from food and drink sales will be donated to the pupils' chosen charity Community First Responders who will also be attending the event. "Ideas into Action is such an important project because it's all about encouraging young people to get involved in local democracy and enabling them to make a difference in their communities," says Councillor Eileen Lintill, Cabinet Member for Community Services at Chichester District Council. "It's wonderful to see pupils showing such passion and enthusiasm for the issues that concern them and I am always impressed by the ideas they come up with. The pupils from the Road Recognition Party have all worked extremely hard to develop their ideas and organise this road safety event and I would urge everyone to come along."